So on this beautiful Saturday morning, WangFood brought me to her favourite brunch place in Montreal. Obviously I had high expectations for this restaurant due to her constant raving about it. With the high expectations, I’m pleased to say, it did not disappoint! We arrived at around 10:20am, and there was no line. We were able to get a table right away; the service was prompt. 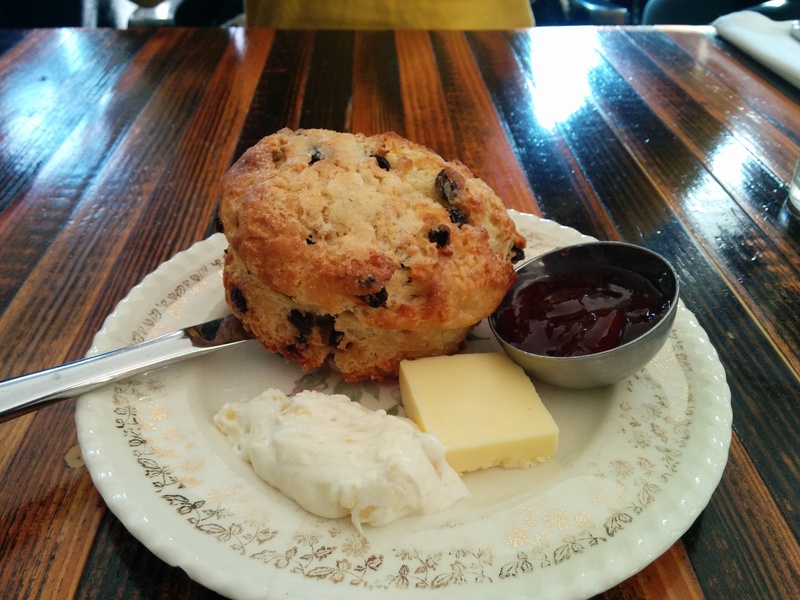 We are both scone-lovers, and she highly recommended me to try it here at Lawrence. That I may even want to take one home after eating. The freshly baked raisin scone was served on an incredibly cute plate, with clotted cream, butter, and strawberry jam. We split the scone between the two of us. The first bite was one of those that make my eyes widen because the flavour is absolutely perfect. The scone was incredibly fragrant and the dough has enough butter taste and flour without making it incredibly greasy. When I break off a piece, the inside is soft yet crumbly (none of that mushiness that one often encounters with scones). The outside was slightly crunchy, and the golden brown colour was absolutely beautiful. The raisins added a tartness and sweetness to combat the heavy butter flavour. It was obviously done to perfection. Paired with the clotted cream and jam mix, it was like heaven. Perhaps it’s because I love scones, but you need to try this before judging! 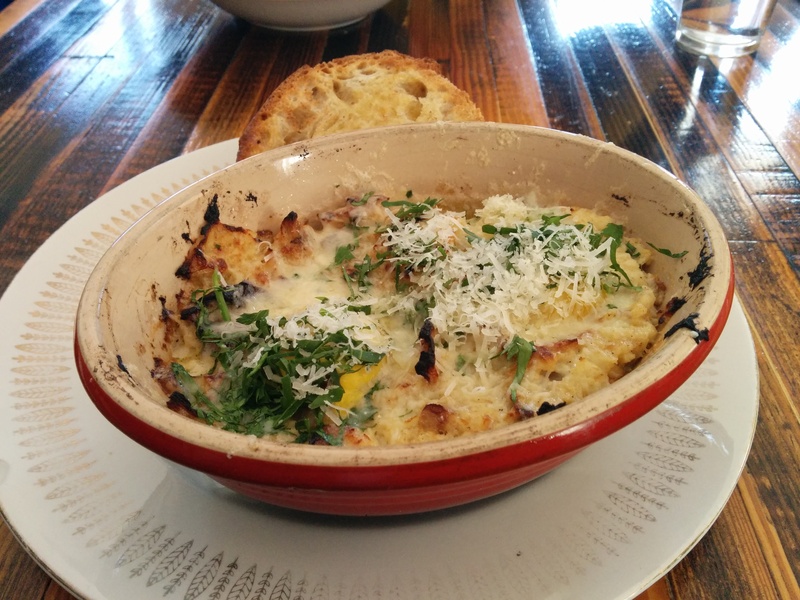 I then got the baked egg with celery root and oyster mushrooms. Topped with grated parmesan and parsley, which added colour to the otherwise plain-looking dish. The celery root was cooked until tender, and slightly resembled the softness of cooked potatoes, without the powdery taste. There were two egg yolks that were baked to perfection (in my opinion), and burst into the golden goodness I love. For those of you who prefer not to eat a raw yolk, this may not be the dish for you. The oyster mushroom was crunchy and added the much needed firmer texture to the dish. Everything was smothered in a cream-based thick sauce, and had a more earthy taste to it. I also loved that when it came, it was piping hot. The baked egg was served with two pieces of buttered toasted bread, which I was unable to finish, but are great for getting that last bit of yolk. Overall, everything I tasted was absolutely amazing (I had a bite of WangFood’s Pig Trotter). I will definitely be coming back to try their other dishes (perhaps with tfung). Service was good, I didn’t ever have to wait to get what I wanted, they seemed to know and came over fairly promptly. The restaurant seats about 30, which may be the reason that service is more manageable. If you haven’t tried this amazing brunch place, please do! It’s also situated near lots of other amazing food joints (Voro, Kem Coba, Fairmount Bagels) as it’s on Fairmount and St Laurent. I’ve always regarded patati patata as my go-to authentic poutine place. I never minded that service was slow and you had to wait because I liked that their poutine was always of steady quality. However couple nights ago, I had the worst eating experience ever. Service was slow as always, and things were as they always were. However when we were leaving, we left a 10% tip for their slow service and overall minimal effort of serving. The one in charge of cooking, who took the money had the nerve to yell at us “that’s a pretty lame tip”. I’m still bothered today, and was very taken aback at the fact that they expect a heavy tip for fast food. I’ve never seen anyone tip McDonalds, and no one says anything about that. But me leaving a 10% tip was apparently untolerable by the people at Patati Patata. Recently I’d read an article from Montreal Gazette about two anonymous waiters who were “tired of” certain behaviours of their patrons. Some of these annoyances included “leaving less than a 15% tip”, “asking for a booth”, “making puns”, “complimenting the food but leaving a bad tip”. I had hesitated to writing any type of response on this blog, since I had never had a truly horrible experience. Well I just had it at a place I regularly recommend my friends to. They can be sure that I will never recommend anyone to a place where the waiters yell at you. The service industry is a difficult sector, I agree. I’ve only ever had one experience that was truly outstanding, and it merited a 30% tip. Their service was that they gave me what I needed and wanted without me even asking. They could tell by my body language what I wanted, and promptly came over to tend to me. That’s service. When service falls short, at a nice, fine-dining place, along with the quality of food, typical tips would be 15-25%. I have no problems with anyone asking for the reason of a lower amount of tip. I’m happy to let you know what I expect as a customer. And hopefully you will be able to please a wider range of patrons from my comments, and next time I come back you will receive a bigger tip. But to be spoken to like that by a fast-food place was absolutely unacceptable. I enjoy your food, but I do not have to be subjected to verbal abuse. I will be telling everyone to avoid your place now. Thanks for reaffirming my belief of you get what you deserve. A while back, tfung came to visit me in Montreal. Needless to say, we went to eat at different locations all over the city. Since Mtl is known for brunches, I decided to look up a place where we could go to. This was the joint that I found, and I have to say, it seemed extremely far at the time, but since I had planned my work well, I had the whole weekend free with tfung. After the brief walk from the bus stop, I was super excited because the scenery had transitioned from sketchy industrial area to hipster lofts and cute cafes. We walked in and got a seat right away. 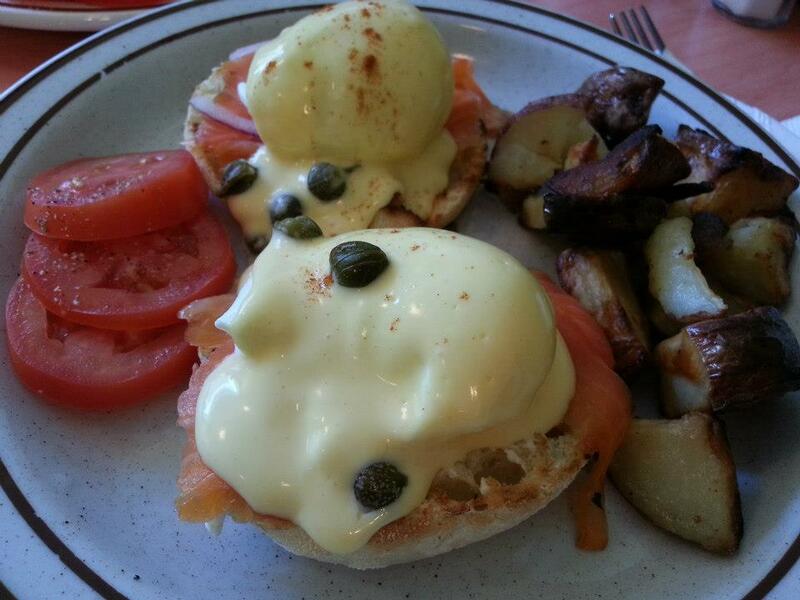 Le Vieux Velo is a small restaurant that specializes in Eggs Benedict. Obviously we went for just that. I got l’Atlantique, which was topped with smoked salmon and capers. tfung got the Florentine, with ham and spinach. Both came with home-cooked potato wedges, and topped off with their secret recipe Hollandaise sauce. This was probably the best eggs benedict I’d had to this date. The sauce (which I don’t even want to think about how much butter was used) was absolutely amazing. It was so smooth, full of flavour, creamy and doesn’t leave your mouth with that fat-feeling. In terms of the two different dishes, I liked the Florentine more. The smoked salmon didn’t do much in terms of texture, and the taste didn’t go too well with the eggs, in my opinion. The capers were just a burst of saltiness from time to time and was annoying to keep on the fork. 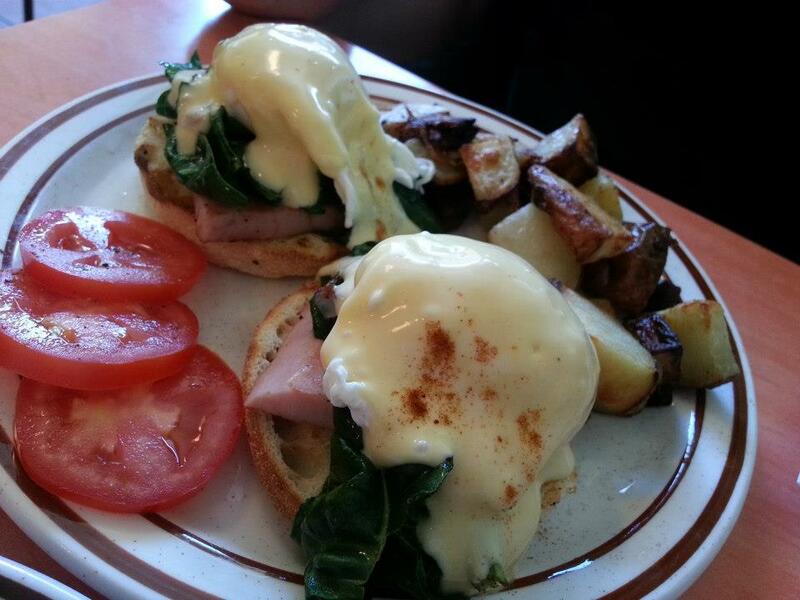 For the florentine, the ham was chewy enough, and the spinach added that leafy green texture, working very well with the gooey center of the yolk and the creaminess of the hollandaise sauce. The muffins were quite good. They were lightly toasted to add a slight crunch, but still retained the softness, so it is not too difficult to cut or to chew. There were many times that I had eggs benedict where each bite I was left chewing a tough muffin. The potato wedges were done very well, and tfung really liked them. He loved the crunch on the outside and the seasoning. It had a slight spiciness to it (black pepper), and wasn’t too salty. The inside of the wedges were piping hot, indicative of it being fresh off the pan. Overall I love this brunch place. Although it’s a little far, I don’t mind going on a fairly nice day. You do have to wait if you go during the Sunday brunch time, but I usually can avoid it. Their eggs benedict are a must if you do pay them a visit. But I haven’t tried any other dishes on their menu, and to be honest, I feel like I can’t deviate from their benedicts.